Well I just spent another hour of my life (that I'll never get back) listening to the just released recording of the Alibaba December 2018 Quarter Investor Call. 1.) Revenue grew 41% from Q3 2017. MAUs and AACs (Customers) grew 20% over the same period. They did not distinguish, (at least that I could see) the difference between "newly consolidated" or "new retail" revenue from organic growth. Everything is still one big "blob". 2.) Cash and Cash "Equivalents" declined by $5.095 Billion USD from December 2017. Remember, in China (Unlike under GAAP and IFRS Rules) Cash "Equivalents" include demand notes payable from insiders, party members, off shore Shell-Companies and executive family members, whether they have gambling/drinking problems or not. 3.) Property & Equipment, (net) purchases were US$1.456 Billion in the quarter. 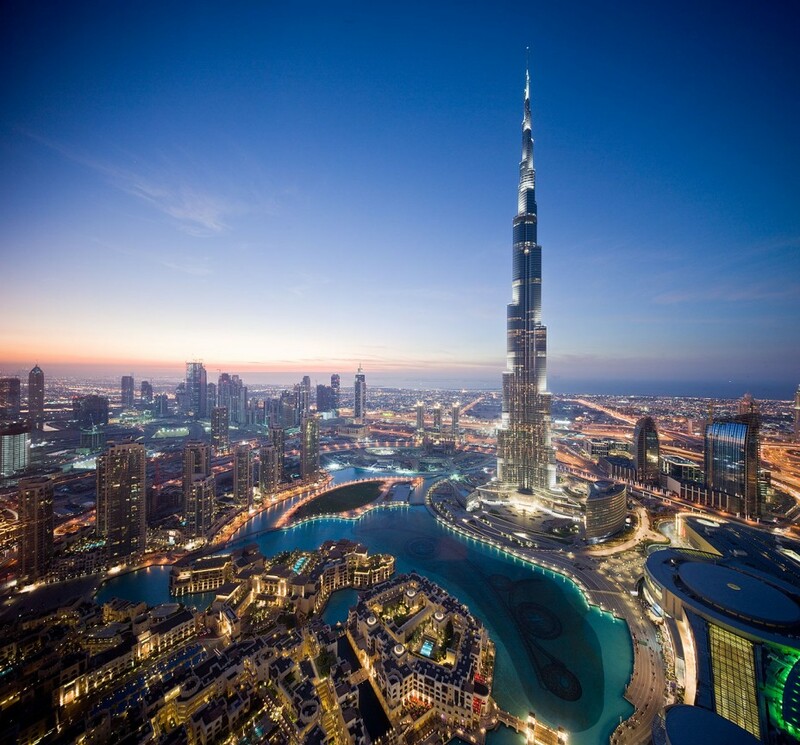 (With No mention of what it might be comprised of) That would make property acquisitions during the (3 month) quarter the rough equivalent of the cost to build the Burj Khalifa. (i.e. the tallest building in the world) Impressive indeed, but if I were a BABA investor or analyst, I might like to have a bit of "color" describing what this gigantic, material increase was. "During the quarter, we did not recognize any royalty fees and software technology service fees under our profit sharing arrangement with Ant Financial. In the current quarter, Ant Financial continued its strategic investments to acquire new users and capture growth opportunities in the offline payment market. Currently, Alipay and its affiliates have over 1 billion annual active users globally. In the coming quarters, Ant Financial expects to continue investments aimed at capturing the strategic opportunities amid the digital transformation of China’s real economy." Perhaps an analyst asked a question about this and I may have missed it, I nodded off a couple of times during the recording. If so, forgive me. To my ears, Daniel Zhang's calm, serene, angelic voice sounds a bit like the ocean and it lulls me to sleep.....but I digress. So Ant Financial, with Alipay's 1,000,000,000 active users is not making any money for all their effort..... and may indeed be losing money, perhaps boatloads of money if their loan underwriting is anything like Alibaba's accounting. 6.) During the presentation, the Alibaba Crew again raved about the success of their "Luxury Pavilion". "During the quarter, brands including Valentino, Ermenegildo Zegna, Stuart Weitzman and Sergio Rossi opened Tmall flagship stores and joined our Luxury Pavilion. Launched in August 2017, Tmall Luxury Pavilion now offers more than 80 brands. Products range from apparel and beauty items to watches and luxury cars." When you search the TMall site you see thousands of these "luxury" items listed with pictures and prices.....along with "0" in the "monthly turnover" and maybe a meager (handful) number of views and few/no reviews. When you pull the financial statements from these "luxury brands" you'll see that, the maximum volume, at the most, that could possibly be derived from these sales, even if you credit Alibaba with the entire annual volume of "Asia" for the brands listed on TMall (For example: Yoox-Net-A-Porter aka Moschino http://www.ynap.com/ et al) you'd see that total sales can't be more than a few million dollars. 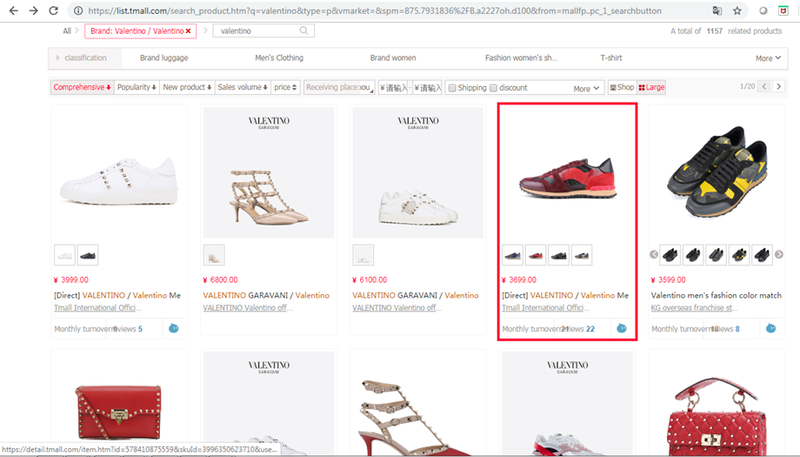 The "luxury pavilion" sales on the Alibaba platform probably dosn't even come close to being material or relevant. Conversely, there was again no discussion of the rapidly expanding TMall/Taobao "Court Ordered Troubled Asset and Bad Loans" division. I can't believe they once again left this high-growth arena off of the 6-K discussion. So why would Alibaba waste valuable space on a 6-K and significant presentation time to even bother mentioning these goofy low volume "luxury pavilion" businesses and gloss over something like....Oh....I'don't know...acquiring $1.456 Billion in fixed assets (e.g. 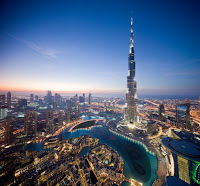 the Burj Khalifa) or describing a US$2.4 Billion accounting gain (Eight (8) Trump Towers) in the quarter? I sure wish an analyst would ask about THAT! 7.) Operating Costs for this "New Retail" gambit are apparently out of control. When we examine page 17 of the presentation, we can see expenses (Cost of Revenue, R&D and SG&A, all excluding Share Based Compensation) increased from 49.4% of revenue in the December 2017 quarter to 80.7% today. Alibaba management seems to be willing to pay an ever increasing, perhaps limitless, price for the next dollar of revenue. 8.) Questionable Assets (Investment Securities, Investment in Investees, Intangibles & Goodwill) increased a whopping US$10 Billion in the quarter. 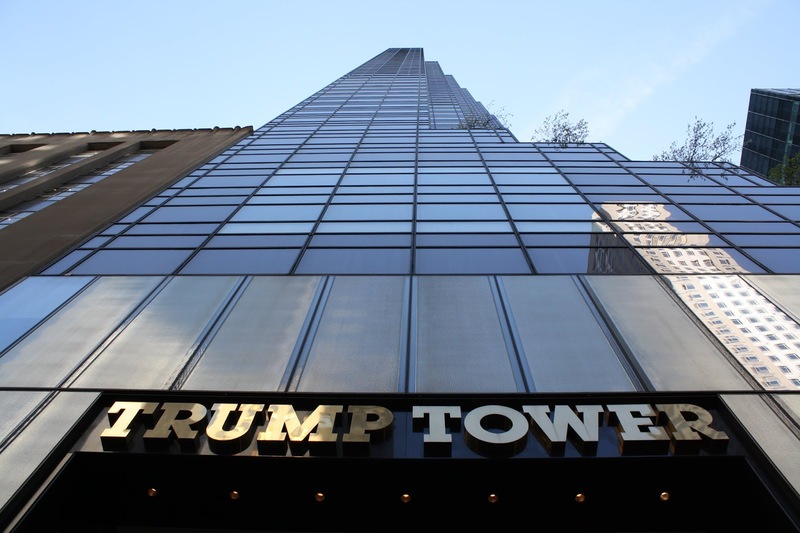 (That's 33 Trump Towers in just One Quarter folks!.....Yowzahh!!) Again, no real, rational explanation. This crap-olla just keeps going up. It's 58% of the balance sheet now....up from 0.0% in 2015. 9.) When we look at the Segment Income (Loss) we see that the only Segment making money is the "Core" Business. (Page 20 of the Press Release) The rest of the business segments (Cloud Computing, Digital Media and Entertainment, Innovation Initiatives & Other and "Unallocated") continue to lose US$2 Billion a quarter like clockwork. Total Segment Income actually decreased by 20% over the comparable year to date period in 2017. (2017 RMB 60,093 vs. 2018 RMB 48,139) It appears as though "earnings", for the Alibaba Management team is more of a theoretical concept than an action item or goal. So....What did Mr. Market think of all of this? He absolutely loved it! Up 7%! Volume ended the day at twice the 30 Day average....36 million shares traded.....but it was actually on the low end of what you might expect. There have been many 50 million share plus days, usually on the way down. 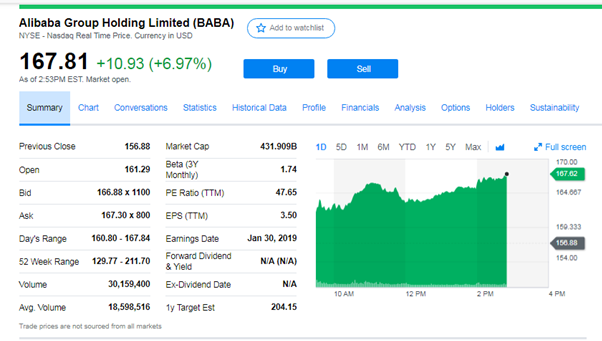 Now that the CCP has reestablished a pricing/value expectation, we can probably expect a pullback, but with BABA.....who the heck knows? The above is exactly why you can't short this beast. My thesis has long been that the CCP funded "Caymans Crew" steps in and drives the price up just when you think the numbers are so silly that nobody would believe them. This is the same methodology the CCP deploys to support the offshore RMB trade. The RMB trades at 6.80:1 today but based on Mainland money supply expansion it should be the financial equivalent of a roll of Charmin tissue. Thank goodness Chinese currency is at least "squeeze-ably soft" and will eventually be put to good use by those unfortunate enough to be stuck with it. There is absolutely no doubt, at least in my mind, that this is the greatest, systemic and by far most entertaining financial fraud in history....the post WWI Wiemar Republic "paper mark" scam was good, but this Chinese money mess, as far as creativity, enormity and sheer chutzpah, absolutely leaves those cranky old German bankers in the dust. Of course, all of this was brought to you by our "heads in the sand", good old boy political and financial leadership......hey a guy's gotta make a buck! "Koubei had a very limited impact to our local consumer service revenue this quarter." They barely had any revenue at all... but hey that's gotta be worth at least $4 billion right? Just an FYI. PPE purchases were $600M Q/Q not $1.5B in point 3 above. Also, point 4 is extremely misleading/inaccurate. SBC is 22% of Net Income or 5% of revenue which is not all that dissimilar to global peers. Actually, it was a really good quarter considering China's slowdown. Really? Koubei? It's stunning that you're still one of only a handful of people who get BABA right. total equity went up 80bn CNY YoY but they invested 135bn CNY... Where did the 55bn go?